It’s not hoarding, it’s collecting. I recently commandeered my mantelpiece as a bookshelf, and now our heating has changed from coal to bio-fuel, I appear to taking over the hearth, as well. All around the house are piles of books arranged in what I am kidding myself are arty piles, stacked in wicker picnic hampers up the stairs. I’m also tempted to try one of these book Christmas trees, but that won’t be cool come February. What I really need is decent shelves, lining all the walls, which is my dream for the next time I buy somewhere, but this house is not only rented, but the has not been re-plastered since Victoria was on the throne, and any kind of drilling causes giant chunks to fall off. Hell, even stripping the wallpaper makes the plaster fall off, like trying to shell a misbehaving hard-boiled egg. I have book cases everywhere, and since I find it almost impossible to get rid of books, I’ll just keep needing to buy more cases, and find more ingenious and less dangerous ways of stacking them. That is until my daughters sends my name into one of those hoarding programs, or stages an intervention. ← Lovely Apples: Four for a Pound! Here’s a story, erm, confession… I have shelves in three rooms, but books reproduce when your back is turned (they are worse that rabbits). I even have a coffee table with cubby holes which I use mostly for literary journals and the few magazines I get. Ah but then books pile up on top. When I had pulmonary embolism and went into cardiac arrest last summer I was lying on the couch (I had been asleep). When my son tried to move the table to get me on to the floor, he broke it. When the paramedics came, they broke it further due to the book weight. My thought as I was recovering was: If I had died, what everyone say about the vast amount of books around me! To make matters worse (sort of) ordered books continued to come in while I was hospitalized! Thanks, the PE was belated souvenir of a wicked long flight home from my trip of a lifetime to South Africa – go figure. I was tired and swollen but did not recognize other signs and I have no heart disease or risk factors. So it was a shock, especially because if my son had not been home or heard me, I would have died. That is hard to process emotionally. Otherwise, the lingering problem is my aching rib cage – CPR likely cracked ribs. But hey, for the first 4-6 weeks I read a lot of books, I couldn’t do much else! Reminders of our mortality like that can be really scary, especially when, as you say, you don’t have the risk factors, you were very lucky 🙂 A friend had that recently after a trip to Australia, she went to the doctors thinking she had a cough and collapsed just outside his office, at least she was in the right place! Hi Lucy! Glad to discover your blog, I also suffer from the same addiction. I ‘collect’, in order to read in the bath, but also pile them into a Kindle, just in case I find myself somewhere with no access to a bookshop, and buy audiobooks to listen to in. The car. So many books, so little time. Sigh…. Hoarding books does make us realise how inventive we can be at squeezing even more books into a finite space. 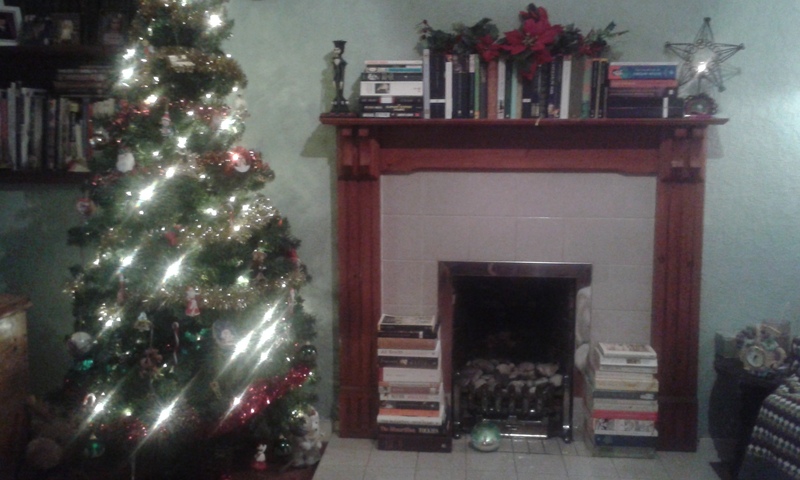 I like the tree and think you have a good eye for book ‘furniture’ as it were, keep doing it! Your dream of bookshelves everywhere is a beautiful one, I wish for the same and one of those ladders on rails that go around the wall so I can use them to swing around and sing like some Disney movie. Ladders!!! Yes! Like in Jonathan Strange and Mr Norrell, towering shelves with walkways that than be scrambled between via the moving ladders. And as you say, singing and stuff. I’d totally do that.